Posted on July 23, 2010 by Ching under Movies. 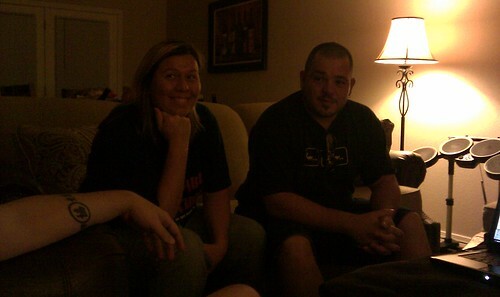 The Dills came over for movie night last night. We watched Legion. The dialogue left a lot to be desired, but the movie was pretty entertaining nonetheless. Maybe because I love Paul Bettany. The first time I noticed him was in A Knight’s Tale, one of my favorite movies. I think all of the side comments made the movie. Brian absolutely hates it when people talk through movies, but Legion was just begging for it. I mean, who the heck names their kid Jeep? And if Jeep is the protector and all mankind depend will depend on him, then we are all in big trouble. LOL. Michael, on the other hand, can be my protector any day. Did I already mention that I love Paul Bettany? In their defense, we didn’t get to start the movie until late. They didn’t arrive at our place until after 8 pm and then that’s when Mandy (our next door neighbor, who we love because she super nice and super quiet) got home from running errands. She was put in charge of the United Way fundraising campaign at her work, Stinson Morrison Hecker, so she wanted to borrow our electric grill for a cookout they’re doing tonight. When she first asked me this on Tuesday, I told her it was no problem but I was worried that she wouldn’t be able to transport the grill to her work. She thought it would fit in the back seat of her car. I told her that Brian could put both grills (she was taking her own grill as well, but needed a second one) on the back of the truck and take it to her work if she wanted. She put her grill in the trunk of her car and it fit. She has an indoor/outdoor George Foreman grill that disassembles. Ours, unfortunately, does not. 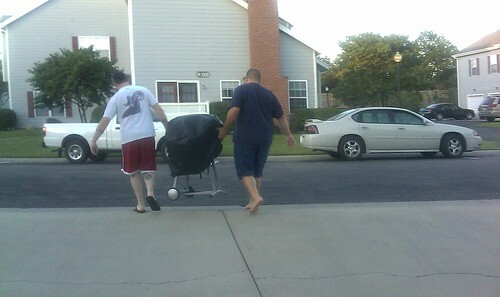 Jay and Brian tried to put it in her car, but there was no way it could fit. The only alternative was my suggestion — use the truck to transport the grill. So off Brian and Jay went. They followed Mandy who had her grill in the trunk of her car to the Stinson Morrison Hecker office down the street. Becca and I stayed at home and waited for them. Mandy’s office is just two minutes away from our place (which Mandy has found to be both an advantage and disadvantage) so I reassured Becca that the guys wouldn’t be gone long. Little did I know that they would get a tour of the building and take FOREVER. Brian, the wonderful husband that he is, knew I would want pictures (because I’ve never been inside the Stinson Morrison Hecker building) so he dutifully took photos and posted them on Flickr for me. 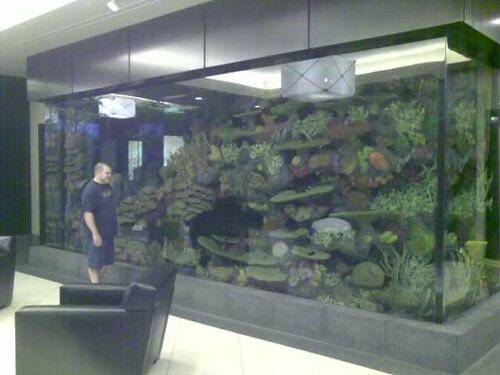 Check out this huge aquarium in the lobby! 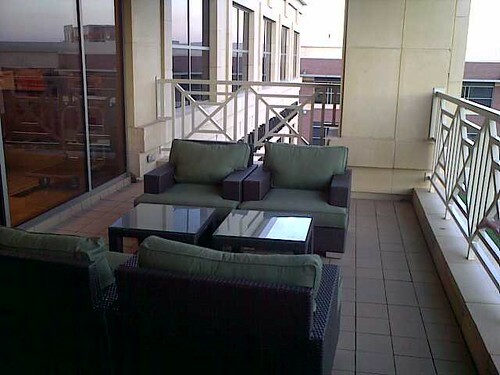 They also have this nice, huge balcony overlooking the water. 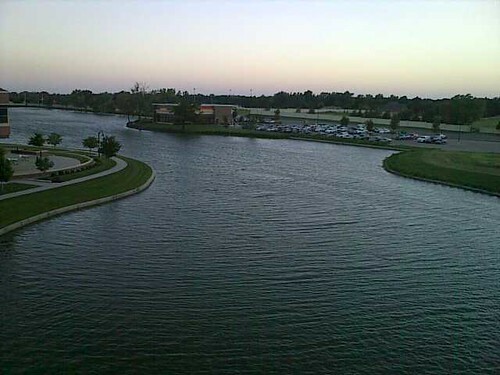 I love the Waterfront area. It’s so pretty. Brian and I have yet to bike over there. We definitely should before the summer is over. So anyway, Brian and Jay returned raving about Mandy’s fancy office building. It was only after they simmered down that we started the movie. So yeah, we were up late. Tonight is Filipino movie night with Jen and Armando. We are going to try not to stay up too late because we are taking Brian’s parents to the Kansas Cosmosphere in Hutchinson tomorrow. Replies to "Movie Night — Legion"